The early EPs of any project are always fascinating, providing insight into how exactly an artist finds their footing. Featured on this week’s Monster Bunker, Flicker Rate is a one man instrumental post / math rock project, devised and played entirely by 17-year-old Spencer Bassett. 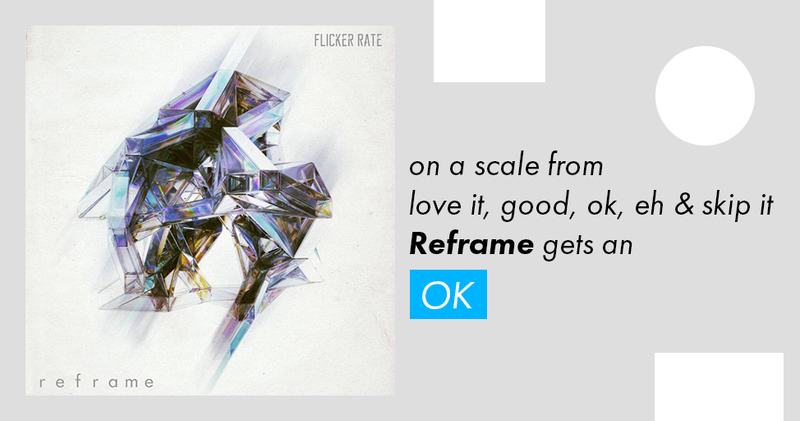 Reframe is only the second EP released by the band, so it’s still early days for Flicker Rate. This is somewhat evident in the material itself; there is a bit of an absence of polish, where some of the songs feel like they need a little more work to truly be finished; and there’s definitely a jarring leap in quality around halfway through. That being said, there’s still plenty to like on Reframe; and at less than 18 minutes in length, it’s short enough that there’s little excuse not to give it a chance. The back half of the EP contains by far its strongest material, which is an unusual decision. Leading with weaker material is rarely a good idea. That second half really is worth it though. “Spectrum“ is just a delight to listen to, dancing effortlessly from one tight groove to the next. The whole song starts to wash over the listener in this wonderfully entertaining way, and it’s over and out before you know it. I’d be surprised if you told me that Flicker Rate was entirely unfamiliar with Scale the Summit, because “Spectrum” feels like a commendable attempt at capturing their sound. “Airspace,” though possibly not as much fun as “Spectrum,” is still just as polished, with each riff dovetailing nicely into the next. The song builds up energy and momentum, starting simple and introducing increasingly complex melodic ideas without ever leaving the listener behind. It’s also worth noting how good this EP sounds; the whole thing was recorded in a bedroom over the course of a summer, but it sure doesn’t sound like it. I’ve heard albums produced in professional studios that sound much worse than this, and the strongest material is given plenty of room to shine without ever being hampered by the production. Annoyingly, however, we don’t start with the strongest material. The EP’s opener and title track, “Reframe,” is oddly restrained. We start with only the drums and the bass, on top of which layers of guitar are put on…and then taken back off again. There’s very little lateral movement throughout the track; instead, content builds straight up and then comes right back down again. What’s there isn’t bad, but it could definitely use some more work. Odder still is “Summit,” which is, functionally, two songs. I mean that pretty literally; on first listen, I was genuinely fooled into thinking the song had ended around halfway through. It’s two halves, one heavy and one more ambient, with both having the same problem. Despite perfectly good ideas in terms of riffs and composition, those riffs overstay their welcome until they’re no longer interesting. “Summit” could have been a much better song if certain parts were allowed to more freely collide with the harsher parts slicing in and out of the more ambient melodies. To be clear, neither of the first two songs are particularly bad, but neither of them are particularly compelling either. Reframe shows an incredible amount of promise, and even its worst tracks are still pretty good, with an abundance of excellent ideas that would only need a small amount of work to become truly compelling. This EP is definitely worth a listen all on its own, and it would be a mistake not to keep an eye on Flicker Rate and Spencer Bassett from here on out. OK.